Toddler Recipes: Baked cinnamon apples make a sweet healthy treat. Delicious, naturally sweetened snack with a hint of cinnamon makes this a wonderful healthy treat. 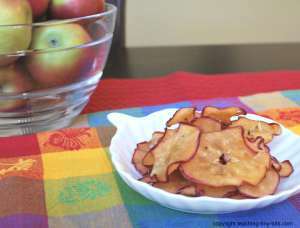 A dehydrator would probably be the best way to make apple chips...but girls and I wanted to try baking some. This recipe did take a little bit of time for just a couple apples but I am always happy knowing I am giving the girls a healthy snack without extra sugar or preservatives...and it did taste great! The end result was apple snacks that are soft and chewy with a little crispiness on the edges. Thickness of the slice and length of time baked will also determine how crisp it becomes. In a large pot pour 2 cups of apple juice and add cinnamon stick. Heat until it boils. Meanwhile, slice 1/2 inch off the top and bottom of the apple and discard. 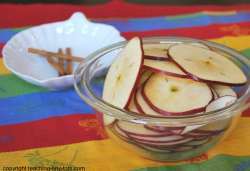 Slice apple into 1/8 inch slices. Drop slices carefully into boiling juice and cook for 5-6 minutes or until slices appear translucent and lightly golden. Line cookie sheet with parchment paper or a wire rack. With slotted spatula or tongs remove apple slices and placed on paper towel lined plate. 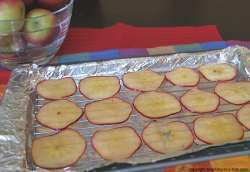 Place the apples slices in a single layer on the rack or parchment paper without overlapping. Bake 40-60 minutes turning over after 30 minutes for "softer apple chips" or bake for 1 1/2 hour-2 hours turning over every 30 minutes for crispier apple chips. Remove from oven and let cool completely before storing in airtight container. A mandoline makes it very easy to slice thin and evenly. If you do not have one, a good serrated knife may work. The thinner the slices, the crispier it will get. We used a cookie rack and I let it cool on it which caused it to stick some. I think I will try parchment paper the next time. We baked it for the 50 minutes and it came out a soft, chewy consistency with the edges having a slight crispiness. Very sweet and tasty...girls loved it! While this is not a toddler recipe, here are some ways to get your child involved. Write out the recipe for your child to follow. Line up the ingredients on the counter so they can match ingredients on the recipe and follow along. Count how many apples are to be used. Ask an older toddler to predict how many slices can be made from one apple. Discuss the different varieties of apples, green, red, dark red, yellow. Count how many slices of apple are on a tray. Let your child close his or her eyes and smell the cinnamon stick and have them guess what it is. An apple begins to ripen when it is picked. In a controlled climate environment, it can be stored for a couple months. For home storage, most varieties of apple can be stored for approximately two weeks. Some types of apple, like the Granny Smith and Fuji, have a longer shelf life. The nutritional value of apples will vary slightly depending on the variety and size. Books are a great way to learn more! There are a lot of wonderful toddler recipe books as well.